This article is the third in a three-part series exploring the intangible metrics that give a public space a sense of place. Read the first article on affection here, and the second article on comfort here. When someone enters a public space, their first instinct is to find a place for themselves—or to make one. The best public spaces embrace this human urge to improvise. People want to customize their experience, and make themselves at home in public spaces. From how people sit to how they interact with each other, the great dance of public space is only possible with room for a dramatic dip, a change of partners, or a change of styles. The most important layer of a great place is how people use it—not the design itself, but the emergent activities, movements, and interactions it facilitates. A public space that inspires improvisation is rich with “affordances,” a psychological term for those things in the environment that beckon us to interact. For example, a moveable chair offers many more affordances than a bench. While you can certainly sit on a bench, many are designed specifically to discourage any other kind of activity—no picking it up and moving, no supports for eating, drinking or working, no lying down, no adjusting your distance from strangers. Moveable chairs, on the other hand, invite more than just sitting; they can also become a makeshift table, workspace, footrest, or they can be rearranged to create an instantly better social situation. Public space both shapes and is shaped by improvisation—whether we notice it or not. “Placemaking is actually an innate ability that we all have,” says Fred Kent in the video above. “We all know what a good place is. We all go to good places. We all thrive in those places.” Though a public space is never finished, it comes closer to its ultimate purpose when people make it their own. 1. Adjustments: Perhaps the craving for a personalized experience of public spaces is why moveable chairs are the best option for seating in public spaces. Besides being more economical than benches, they give sitters the chance to put their feet up and arrange themselves at will. William H. Whyte was a proponent of moveable chairs, noting that most people move them by mere inches before sitting—signalling a polite “social distance” from strangers, and creating their own unique experience of the public space. 2. Triangulation: A great public space is more than the sum of its parts, and triangulation (see #7) is where that added value comes from. Triangulation refers to the way that “uses” can be strategically located and designed to generate additional uses. For example, a place to sit is useful, but it generates more uses when it’s facing something worth watching, and even more uses if you can get something to eat or drink nearby too. None of these individual uses are as effective alone. Greater triangulation opens more opportunities for improvisations. From a crowded subway car to a park, triangulation gets kicked into high gear when buskers enter the scene. The addition of music, dancing, or any manner of entertainment can connect strangers and encourage unpredictable interactions. Buskers ask for embarrassed volunteers, performers tailor their songs to passers-by, children dance along, and strangers whisper about something awesome or awful they just witnessed together. 3. Informal Activities: Improvisation isn’t only for performers. When props from home, like games, card tables, yoga mats, and picnic blankets, begin to pop up in a public space, it’s a sure sign that people are tailoring it to their own needs. When people bring outside elements into a space, they are demonstrating a sense of shared ownership and attachment to it. Too often this kind of activity is prohibited or discouraged. Allowing or even cultivating activities beyond the official plans of a designer or manager are a surefire way to make an empty space into a multi-use destination. Meetings of grassroots community groups, chess matches, and playdates—let a hundred flowers blossom. 4. Perching: When people can’t find a good place to sit, they often resort to “perching,” improvising their own seating on bollards, newsstands, fire hydrants, fences, and even their own briefcases! Perching is a clear sign that something is missing. When user improvisation adds use above and beyond what designers and managers provide, a public space is well on its way to becoming a place. But when users have to improvise to meet their basic human needs, something is wrong. Seating is one way in which people shouldn’t need to improvise. 5. Desire Lines: Advocates of user-driven urban design, like Jane Jacobs and Stewart Brand, often tell an apocryphal tale of a designer tasked with laying out the paths in the main green of a college campus. Recognizing how poorly designers usually predict where people want to walk, the wise designer waited until the first snowfall, and watched where people carved their own paths before laying them out. These user-created paths are called desire lines. In the absence of a wise designer or manager, they are another example of improvisation as a signal of something lacking. In poorly designed public spaces, the heavy foot traffic of users carves “unofficial” paths into the landscape. In a desperate bid to protect precious grass, the most frequent response is to block these paths with all manner of ropes, fences, signs, but often the paths persist—and for good reason. 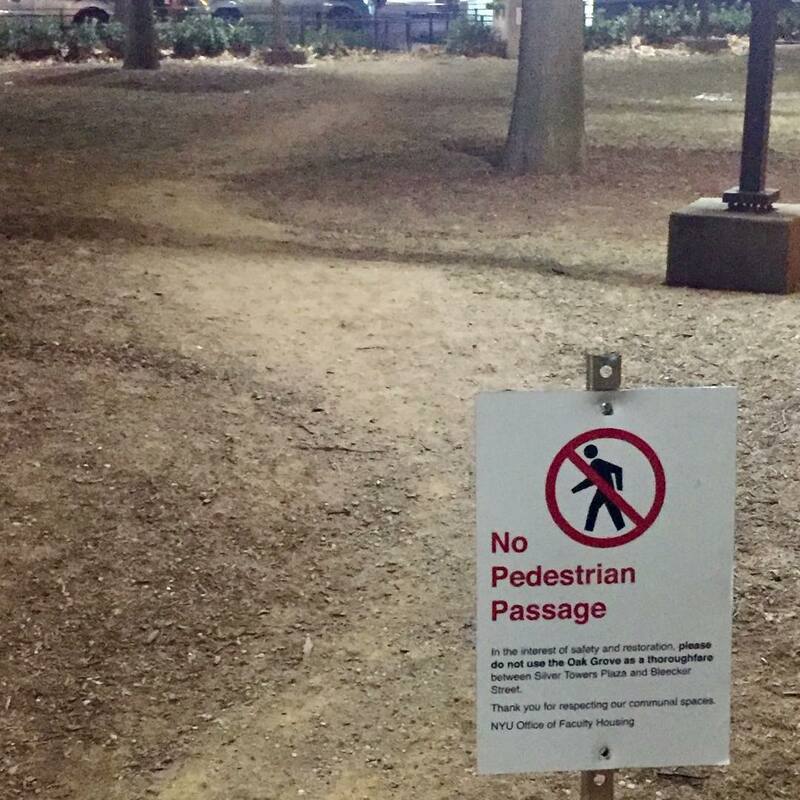 Desire lines are a collective cry for better usability. Public spaces need to reflect the whims and personalities of their users. Without improvisation, public spaces would be sterile, quiet spaces, never living up to their full potential. 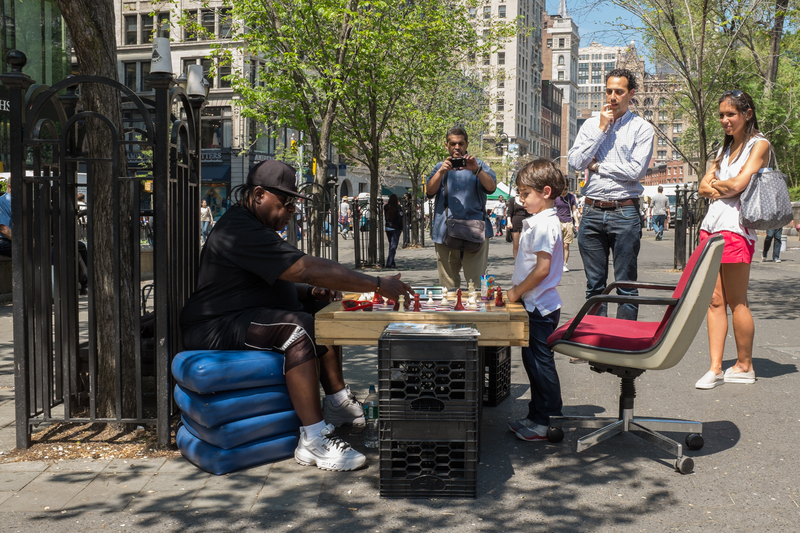 What would Union Square be without impromptu chess games? Washington Square Park without performers in the drained fountain? 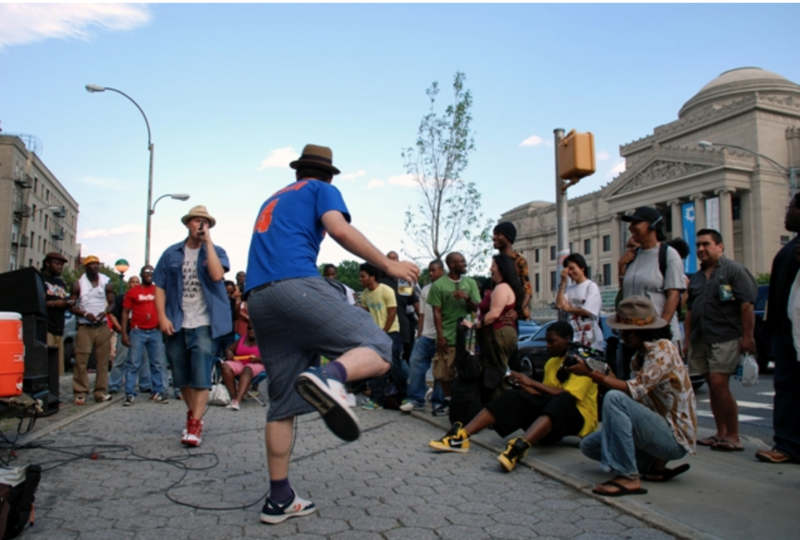 It is improvisation that makes public spaces musical, talkative, and fantastically alive.